Wiring for a PWM Noctua. I need to connect a few new fans to my Duet. Anyway I thought I ask first for a change? I also have a step down converter that I can use assuming that I need to take power from 24v in via step down to 12v. So plus and minus to stepdown from main 24v. 12v plus and minus from stepdown to fans. So where does the signal cables go is I like to have speed control… ? I hope the image below display correctly.. Its the official Noctua pinout. 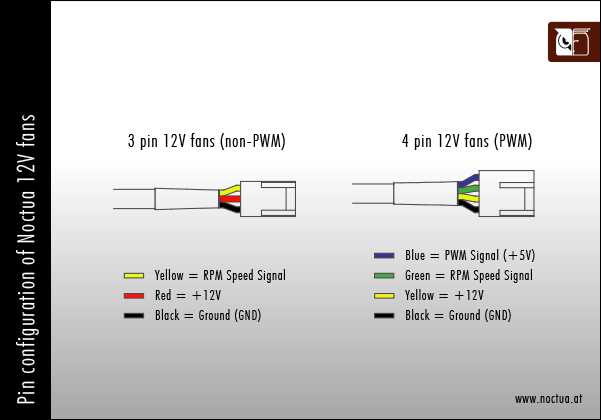 3-pin fans: leave the yellow tacho wire unconnected and treat as a 2-pin fan. 4-pin fans: connect the +12V and ground wires (usually red and black, but yours appear to be yellow and black) to the 12V supply, which must have a common ground with the Duet. If the Duet is running from 12V, you can use an always-on fan connector for this. Connect the PWM wire to the Fan- pin of one of the controlled fan connectors. Invert the fan PWM using the I1 parameter in the initial M106 command. Depending on the fan, you may not be able to turn it off completely. It's possible to connect the tacho output from one 4-pin fan to the Duet to get an RPM readout, but I don't have the details to hand. Regarding the RPM if you could look for it I like to try it out… Its a very cool feature even if the use is somewhat limited. To use the RPM wire on a 4-wire fan, connect it to PB6 on the expansion connector through a diode, cathode to tacho wire and anode to PB6. The diode is to prevent damage to the Duet if the fan negative wire becomes disconnected. A 1N4148 diode should be suitable, I don't think you will need a Schottky one. Perfect, i recived my non-PWM Noctua Fan today. If you want to use a step down buck converter generally you power them from 24v (Vin) from any always on source (not necessarily a fan header positive but that can sometime be a convenient pin) tie the input GND to the 24v Vin GND, run the positive output to the fan and then ground the fan back via the pwm fan pin you want to use to control the fan. How this ties in with 4 wire fans I do not know.